If you are about to take the SHL Verify Inductive Reasoning test or any other SHL logical reasoning test, it is strongly recommended to become familiar with their concepts in advance. With JobTestPrep, you can learn about these tests, review free sample questions with answers, and practise SHL-style logical reasoning tests. The majority of employers in the UK use aptitude tests as part of their selection process. 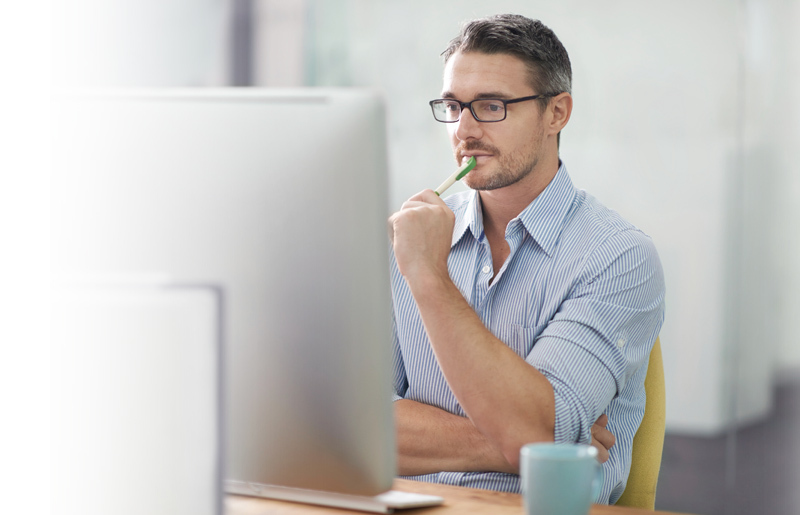 A candidate applying for a position at a company that uses SHL Talent Measurement services is very likely to encounter a logical reasoning test as part of the preliminary online assessment process. What Is the SHL Logical Reasoning Test? The answer to this question is not so straightforward. Technically, there are two main types of logical reasoning tests delivered by SHL Talent Measurement: inductive reasoning and deductive reasoning. 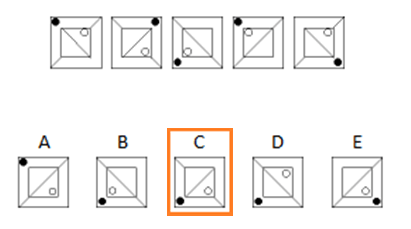 The first type refers to non-verbal, figural tests involving shapes, whereas the second one is based on verbal (and sometimes also numerical) information. However, when using the term ‘ SHL logical reasoning test’, employers and assessors usually refer only to the inductive tests offered by SHL. For that reason, we are going to focus on this type of test. In our discussion, we will use the terms ‘logical’ and ‘inductive’ test interchangeably, always referring to the shapes-based inductive test. Our SHL-Style Logical/Inductive Reasoning Test Practice pack includes practice drills for next-in-series questions as well as other question formats. This is the most common type of logical reasoning test SHL offers, often delivered to candidates applying for graduate, managerial, and executive roles. On this test, you are presented with a series of five objects. 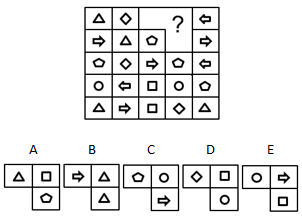 Your task is to select the object that would come next in the series from the five available options (just like in the first example above). The test consists of 24 questions to be solved in 25 minutes. It is administered online at the beginning of the recruitment process, along with other SHL-style Verify tests. If you pass the test, you are often invited to an assessment centre, where you are required to sit an additional, shorter verification test. This test is supervised and is designed to substantiate the integrity of your former results. It is, thus, important that you prepare for both tests. Practising for the online test will increase your odds of qualifying for the assessment centre, where you will have the chance to show your virtues in person. Refreshing your logical reasoning skills once again before the assessment centre will ensure you pass the verification test. Let’s go back to the examples we presented earlier to see what the correct answer is for each of them and how we can solve them. The black dot shifts between the corners of the outer square in a clockwise direction. First it shifts one place, then two places, then one place again, and so forth. Since it moved two places between the fourth and fifth figures, in the next figure it should move one place clockwise. Thus, the correct answer must include a black dot in the bottom left corner. This leaves us with three options: B, C, and D.
The white dot shifts between the corners of the inner square in a clockwise direction, moving one place at a time. Thus, in the next figure it should move to the bottom right corner. Of the three options left, option C is the only one to follow this pattern. Thus, option C must be the correct answer, and we do not need to further examine the series to figure out the movement pattern of the diagonal lines. Now, if we look at the 1st row, we can see that none of the shapes appears twice. 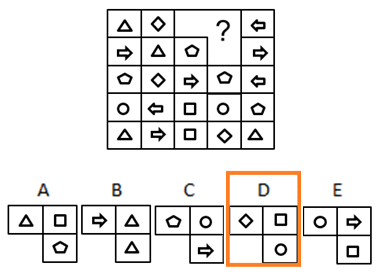 So, the correct answer has to either include one of the shapes that already appears in this row (a triangle, a diamond, or an arrow pointing left), or it must include two identical shapes that do not yet appear in this row. Option E does not fulfil this requirement, leaving us with option D.
Answering SHL logical reasoning questions can initially seem extremely difficult, especially considering the fact that you only have about a minute for each question. However, if you put some time and effort into practising, you can get to know most of the patterns that appear on SHL’s tests, thus arriving at your test more skilled and confident. JobTestPrep offers you a comprehensive preparation experience for your upcoming exam. Our online SHL-Style Logical Reasoning Test practice pack includes practice drills for next-in-series questions and other question formats, as well as an instructional video tutorial. All of the practice questions are accompanied by their answers and full explanations. The video tutorial introduces you to different formats of logical reasoning questions, demonstrates prevalent logical patterns on next-in-series tests, and provides expert tips for solving logical reasoning tests. Our preparation resources can help you become familiar with the commonly used patterns on SHL’s logical tests as well as sharpen your reasoning skills. These skills are guaranteed to increase your speed and improve your overall performance on the real test. How to Choose Which SHL-Style Preparation Pack to Buy? What to Expect When Taking a SHL-Style Test? SHL, and other trademarks are the property of their respective trademark holders. None of the trademark holders is affiliated with JobTestPrep or this website.